At the root of the Stone House Bread is the sourdough. The story of the sourdough and the name of the bakery are intertwined, as Bob Pisor, the owner fo the Leland bakery, explained. "For a long time I struggled with capturing a viable sourdough starter without much success." The process of starting a sourdough culture is fairly straightforward. Flour and water are mixed together and exposed to the air. The bakery uses the new American Levan method which dictates more water in the starting mix and a more regular schedule of feeding the starter flour and water. To get a viable starter, one really must use organic grains to get the necessary nourishment and cultures. What "starts" the bread, turns it from basically inert flour and water to a potent, bubbling mix, is the development of a healthy culture of lactobaccilli, known also as "wild yeast". Lactobacilli differs from commercial yeast in that commercial yeast is actually a plant that lives on the fungus of the "yeast". Bob continued with his story, "I knew that I was doing something wrong, but had no idea what. Then one day I walked into the kitchen and saw Ellen (his wife) bleaching the counter. I got out an old, wooden bowl and haven't had any trouble since. I developed a sort of ritual that I'd go through. On our land there's an old stone house (from whence the name of the bakery comes), and as I was stirring the starter, I'd walk out to it and back. 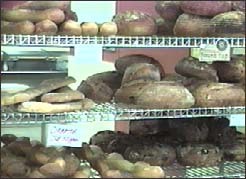 Now we have real Leelanau sourdough, something no other bakery has." Out of the starters that Bob cultured, two were selected, a white starter and a whole wheat starter. The two starters are very different in the smell, the taste, and the action that they have on the bread. One of the bakers, Adam Burke commented, "I think that it's important to Bob that the cultures are truly local ingredients -- he wouldn't seem like a mystical guy, but the ritual's pretty strong for him. There's some people who add a bit of fermenting grapes, apples or a pinch of commercial yeast to their start, but we prefer a straight one. We've got really strong starts, and now we could feed it just about any kind of flour." Nevertheless, the Stone House Bread prefers to use entirely organic flour. The starter is really the first phase of making sourdough bread. Around the "board" -- the 1 1/4" thick, 8 foot long, wooden table upon which most of the work with the dough is performed, conversation revolves mostly around the scheduling of the process. At times in the conversation about "hour zero" or "hour three", it can seem almost as if you have fallen in with a group of military tacticians by mistake. In the process, the starter is fed, or "refreshed", given equal parts of flour and water to increase its size. The refreshment schedule at the Stone House is a 6:6:12 schedule which means that the bakers must plan what breads and the amount they will make 24 hours in advance. The starter is doubled with flour and water at the sixth hour, doubled again at the twelfth, and ready for the next step at the twenty-fourth. The next step is scaling, weighing the flour, water and salt and any other ingredients for the bread. Scaling is followed by mixing. The bakery uses a mechanical mixer which, though it prevents the bakers from developing arms like Popeye the Sailor, presents a problem. The energy of the mixer is translated to the dough in the form of heat. An ideal temperature for dough following mixing is around seventy degrees, but the crew was finding temperatures in excess of eighty. One standard solution is to use very cold water, around forty degrees, in the mix. This proved to be not enough, and so the idea of weighing the flour the night before and storing it in the retarding room (at a temperature of forty to forty-five) was hit upon. Next comes a bulk fermentation in an airless environment allowing the starter to work on the dough, forming the stretchy gluten which gives bread its structure. The dough is divided and rounded and then transferred to linen-lined baskets or or long sheets of line for the resting phase. Molding gives the bread its finished form and after molding it can be proofed or retarded. Proofing is a final rise with the aid of steam from the oven while retarding is a slow, cool proof which allows the bread to be baked first thing in the morning. The distinctive cuts which mark all Stone House loaves are made just prior to baking with a "lamé", an instrument which specially curves a razor blade and allows very precise cuts. Each type of loaf receives its own special cut, important not only in providing the bread with more opportunity to grow, but also give each type a unique character. One particularly interesting cut produces "epis". Made with scissors, the epis are a specially cut baguette which offer small, leaf-like mini-loaves on alternating sides, evocative of an ear of wheat. Following the cuts, the bread is transferred to the oven, either on thin wooden paddles or the loader, a series of racks that employ a roll of canvas which will drop the bread evenly across the stone floor of the oven as the rack is removed. The oven itself is an impressive sight. Eight feet high and about fifteen long, it has three shelves each with their own door and steam controls. After the bread is loaded, it is immediately given a burst of steam. The steam is important for proper development of a thick crust, flavor and allowing the bread to fully rise in the oven. Before one's eyes the bare steel racks of bread quickly fill, and the cooling loaves emit delicious smells and crackling, popping sounds as they cool. By 8 AM, all the Stone House Bread's offerings are on the racks and the driver is loading his deliveries for the day, bound for several dozen locations around Leelanau County and Traverse City. Roundtop (named after a hill overlooking Lake Michigan in Leland) is a white sourdough. The similarly rounded North Country packs more grain and a heartier taste. In addition to cracked wheat and Gill's Pier rye, the bakery also offers a sour and a sweet baguette, the only loaf which uses yeast. Finally, there are the specialty loaves: cherry/walnut, a delightful bread for breakfast and desserts; fresh scallions and dill; sunflower millet; and (not to be forgotten!) sweet apple rollups made with organic apples from Brabenec Farm in Northport. These days, you might find Bob looking a little tired if you come in early in the morning. Adam has left for the West and Bob has had to return to baking full time. He comes in most "mornings" at 12:30 AM. "I'm trying not to count the hours," Bob said ruefully. "We're doing pretty well. Though we never saw quite the number of loaves a day in the summer I had hoped for, we're far beyond my initial projections. I think the really big story about the bakery is the amount and quality of press that we've received." He listed Bon Appetit, the Detroit News and Free Press, Chicago Tribune, an upcoming short in House and Garden and of course a lot of regional coverage. "That really helps. I think we're somehow catching the imagination of writers and readers around the country." 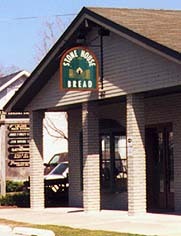 Stone House Bread is located at 407 S. Main in Leland and open from 6 AM to 6 PM Monday through Saturday. They can be reached via email at stonebread@aol.com.